New U.S. Coast Guard data shows that Florida leads the nation in both boating accidents and deaths, a trend that has been growing since 2013. And unfortunately, not only are people getting hurt, but those accidents carry millions of dollars in associated property damage as well. As a result, Florida legislators are starting to take matters into their own hands: some are talking about mandating that boater safety be taught to younger and younger children, and last month, Governor Rick Scott signed a boating safety bill into law that incentivizes boaters to keep a Personal Locator Beacon on board. 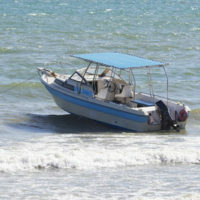 According to the latest boating statistics reflecting total number of accidents and fatal accidents, Florida is entering dangerous waters: Florida had close to 700 total accidents in 2016, almost 60 of which were fatal, resulting in 70 deaths. Reportedly, June happens to be the deadliest time of year to be on the water in Florida. Already, several people have died in boating incidents on the Indian River Lagoon alone, a number of them knocked off their boats and into the water, or hitting their head first on the boat’s hull, falling unconscious, and drowning. Mandatory Boating Safety Courses for Youth? Florida Fish and Wildlife Commission (FWC) currently offers an online boating safety class, which is free and open to all students between the ages of 12 and 18. Those who complete it earn half of a credit and meet their school’s requirements for taking an online course. However, given recent boating tragedies in the state, some state senators want it to go further, possibly starting even earlier in elementary and/or middle schools. In addition, a new law inspired by the two missing teenagers who left on their fishing boat in the summer of 2015 and have never been found seeks to increase boating safety by lowering registration fees for boaters who purchase emergency indicator radio beacons to help locate boaters in distress and/or those who have just been in a boating accident. Advocates also believe that it may save state law enforcement money because they won’t have to work as hard to locate those in need. Had the Jupiter boys–who went missing off the coast of Florida in 2015–had one, their lives most likely would have been saved. The new law takes effect July 1. Dangerous, reckless boating, where someone is seriously injured or worse, is all too common here in Florida. If you’ve been the victim in a boating accident, the attorneys at Friedland & Associates are here to assist you. We help boating accident victims and their families get the care and recovery if they’ve been injured or killed due to someone else’s negligence or misconduct. Contact us today and find out how we can help.